Beacon frequency is locked to a 5 MHz OCVCXO. Specification for the oven is +/- 2E-8 overall frequency stability over 1 year. This gives that the beacon frequency should not drift more than 47 Hz per year. Frequency has been adjusted to nominal 2320800000 Hz in july 2002. The VCXO is an emitter harmonic oscillator with a capacitance diode from the xtal to ground. A PMB2306T from Infineon (Siemens)is used in the PLL-circuit. The PLL dividers are loaded from a PIC (16C84) at power on which then (the PIC) goes into beacon mode and generates the keying of the beacon. 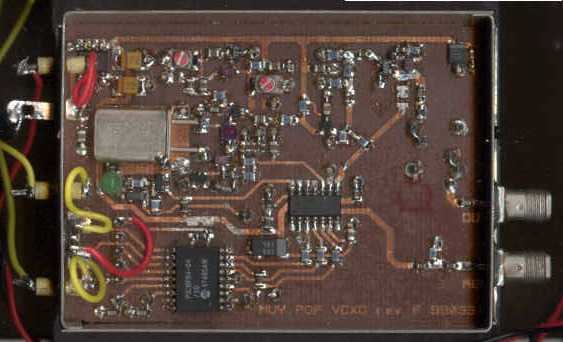 The output pwr from the VCXO box is approx 10 dBm at 96.7 MHz. 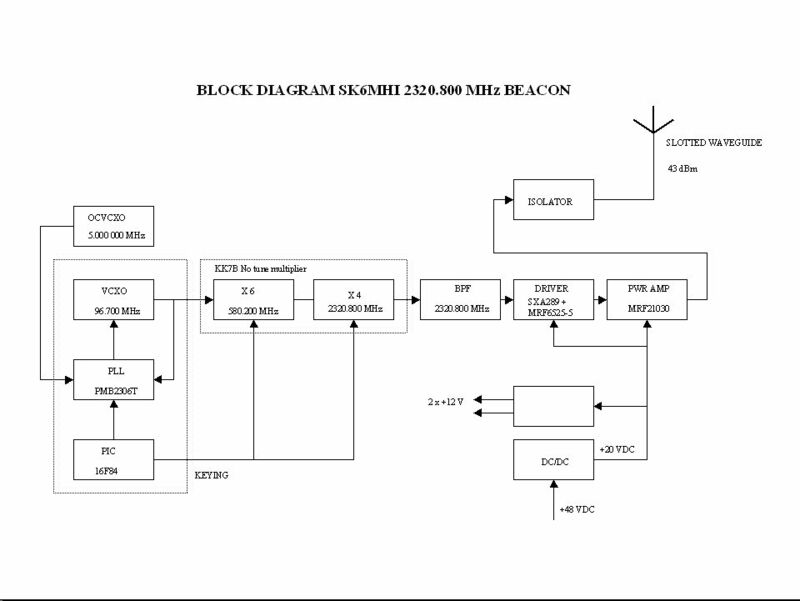 To remove some unwanted spurious signals from the beacon output the signal is filterd by an interdigital filter. The signal from the filter is further amplified by an SXA289 and by an Motorola LDMOS MRF6525-5. The PA consists of one MOTOROLA MRF21030(30 W device for WCDMA 2.1-2.2 GHz)with matching circuits. The power amplifier and driver are fed by 20 V DC. The other parts use +12 V. The reference oscillator has its "own"+12 V regulator. The 20 V voltage is created by a DC/DC module from Lucent. This module can be fed with any voltage between 36-75 V. It is fed with 48 VDC from a transformer, a simple rectifier and filter capacitors. The beacon antenna is a slotted waveguide (built by SM6NZA) which approximately have 10 dBi of gain.